After the success of 1989’s When Harry Met Sally, Billy Crystal solidified his status as a box office draw with 1991’s hit City Slickers. It wouldn’t last. 1992’s Mr. Saturday Night flopped, and 1994’s Slickers sequel fell far short of expectations. At least Crystal had a decent run for a few years, and Slickers reflects his biggest financial success. In Slickers, Crystal plays Mitch Robbins, a New Yorker on the verge of a mid-life crisis. For his 39th birthday, his pals Phil Berquist (Daniel Stern) and Ed Furillo (Bruno Kirby) give him a vacation: they’ll go to New Mexico to participate in a cattle drive. Initially Mitch resists this, but his wife Barbara (Patricia Wettig) sees that he needs something new, so she insists that he go. When the guys arrive in New Mexico, they meet other campers along with the folks who run the ranch. Foremost among them is Curly (Jack Palance), the crusty trail boss who seems to live to make Mitch miserable. The film follows their adventures along the drive. Slickers provides the definition of a “high concept” movie. You can see the pitch meeting in your head: “city boys lasso livestock!” It’s an excuse to place wimpy urban characters in the wild and watch the fun fly. That’d be great if any actual mirth emerged from this long, tedious flick. I suppose Slickers offers two modes. In addition to the nutty “fish out of water” hijinks, we find plenty of sensitive male bonding moments, as the guys use their adventures to understand themselves and grow. Gag! I thought I’d lose it when Barbara tells Mitch – with a straight face and not a hint of irony – to “go and find your smile”. The schmaltz and sentiment don’t improve from there, as the flick uses its situations to pour on cheap emotion. If Slickers managed any amusement, these bits would become more forgivable, but the flick lacks more than a handful of minor laughs. The movie dispenses the occasional chuckle, largely because it throws so many gags against the wall, but nothing memorable emerges. Part of the problem comes from the running time. Slickers plods for nearly two hours, a span that seems awfully long for a comedy of this sort. Granted, it tries to pack in all those emotional moments as well, so I guess the filmmakers thought they needed room for that nonsense. All I know is that it doesn’t fly. 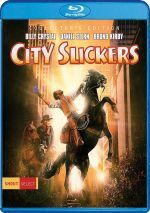 It’s funny: I remember exactly where and when I saw City Slickers during its theatrical run back in 1991, but I recall virtually nothing about the flick itself. It turns out there’s a good reason for that, as the movie is completely, utterly forgettable. By the way, look for a very young – and very obnoxious – Jake Gyllenhaal as Mitch’s son. City Slickers appears in an aspect ratio of approximately 1.85:1 on this Blu-ray Disc. This turned into an appealing presentation. Sharpness worked fine. A couple of shots looked a smidgen soft, but most of the image felt accurate and well-defined. No issues with jagged edges or moiré effects materialized, and I noticed no edge haloes. In terms of print flaws, I noticed a few tiny white specks during the animated opening credits, but the test of the movie appeared clean. With a fine layer of grain, I didn’t discern any use of digital noise reduction. Colors went with a dusty southwestern feel. The tones gave us a natural sensibility and looked very, as the hues appeared vivid and clear through the film. Blacks showed nice depth, and shadows provided good clarity and smoothness. This was a positive presentation. As for the DTS-HD MA 5.1 soundtrack of Slickers, it defined the word “serviceable”. The soundfield usually remained laid-back, though some parts of the flick allowed it to come to life. These mostly involved cattle, of course, and the stampede placed us among the livestock to a good degree. Otherwise, general environmental material ruled the day. Music showed nice stereo presence as well, and the ranch scenes felt reasonably involving. Audio quality appeared fine. Speech was concise and natural, and effects demonstrated good definition. Those elements never seemed especially impressive, but they displayed positive clarity and accuracy. Music offered solid range and vivacity as well. This was a perfectly adequate soundtrack. How did the Blu-ray compare to the 2008 “Collector’s Edition” DVD? Audio showed a bit more range and impact, while visuals came across as cleaner and tighter with superior colors. This turned into a notable upgrade, especially in terms of visuals. 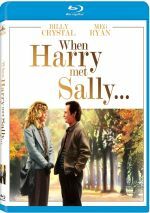 The Blu-ray repeats the 2008 DVD’s extras, and we start with an audio commentary from director Ron Underwood and actors Billy Crystal and Daniel Stern. All three sit together for this running, screen-specific look at the project’s origins and its script, how Underwood got the gig, cast, characters and performances, locations and cinematography, music, shooting the cowboy elements, and a few other production tidbits. The track covers a nice allotment of subjects, and it often proves pretty interesting. In particular, we find some good anecdotes, such as the tale about Jack Palance’s first day on the set. However, it’s not as consistent as I’d like, so often the guys just laugh at the flick, and occasional dead air results. Nonetheless, they make this a decent to good commentary, so it merits a listen. Next we find four featurettes. Back in the Saddle: City Slickers Revisited goes for 28 minutes, 59 seconds and presents notes from Underwood, Crystal, Stern, screenwriters Lowell Ganz and Babaloo Mandel, director of photography Dean Semler, and actors Helen Slater, David Paymer, and Patricia Wettig. “Saddle” looks at the project’s origins and the development of the story/script, stunts and elements of the cowboy scenes, cast and characters, sets and locations, and general thoughts about the final product. “Saddle” takes a pretty general focus, and it gives us a nice overview of the production. The featurette really emphasizes scene specifics, as it runs through various segments of the flick. We find many interesting stories but only a little repetition from the commentary. For the 20-minute, 59-second Bringing In the Script: Writing City Slickers, we hear from Ganz, Mandel, Crystal, Underwood, Stern, and Paymer. The show covers research as well as aspects of the story and screenplay and some performance elements. Mandel and Ganz dominate this look at the movie’s plot, characters and text, but we also find some nice acting insights. I especially like the screenwriters’ willingness to acknowledge the aspects of the script that don’t really work. It provides another informative and interesting piece. We take a look at the flick’s bovine element in A Star Is Born: An Ode to Norman. This six-minute, 14-second piece offers notes from Crystal, Underwood, Stern, Wettig, Paymer, Ganz, Mandel and Slater. We learn about shooting the calf’s birth and aspects of working with a young animal. Norman is arguably the only charming aspect of the movie, so it’s fun to learn a little more about his use in the flick. Finally, The Real City Slickers lasts eight minutes, 55 seconds. It includes remarks from Colorado Cattle Company and Guest Ranch owners Mats and Penny Persson, cowboy Tim Hastings and various folks who attended the program at the ranch. We get a look at what vacations at one of these spots would be like. Although it’s vaguely interesting to see a real operation, it feels a little too much like an ad. In addition to the film’s trailer, we get two Deleted Scenes. We locate “Releasing the Herd” (1:31) and “A New Job” (1:17). “Herd” comes without original audio; instead, Underwood narrates it and lets us know why he cut it. As for “Job” – which offers a form of alternate ending - Ganz and Mandel provide introductory remarks. “Job” seems inconsequential, but I think “Herd” – during which our heroes free the cattle slated to become burgers – should’ve stayed in the flick. It seems much more crowd-pleasing and in keeping with the story. Underwood explains why he dropped it, but I don’t agree with his rationale, which indicates he didn’t think the guys should hurt the ranch owner. Our sympathy is with the cattle, not the owner, so “Herd” should’ve made the final cut. A bland combination of cheap sentiment and unfunny sight gags, City Slickers provides next to no entertainment. Between its dime store philosophizing and its lame jokes, it turns into a slow, long 114 minutes. The Blu-ray brings very good picture and audio along with a consistently informative collection of extras. I doubt I’ll ever enjoy Slickers, but this Blu-ray reproduces it well.